Have you heard of summer learning loss? Studies have shown that kids lose academic skills over the summer months. This loss is estimated to be a setback of about 1 month. It makes sense, doesn’t it? Most parents encourage outdoor play during the summer months plus let’s not forget about all those fun camping trips and other family vacations. Many of us see the summer break as a time to put away the books and enjoy the fresh air outside. My son completed kindergarten in June and I was amazed at how much he learned through his first year of school. 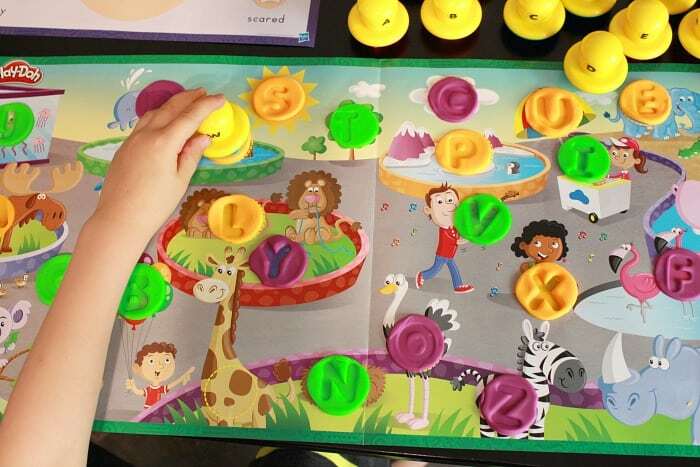 He started with a speech delay and not knowing how to print but then he came out of kindergarten with a new vocabulary, excellent printing skills and he’s already reading! I’m so proud of the progress he’s made and I want to make sure I set him up for success in grade one. 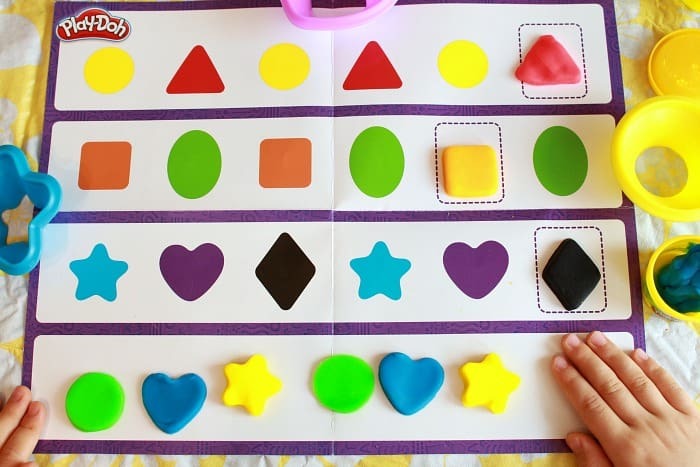 With a little internet searching, I know I could find plenty of free printable worksheets for kids but I want something more hands on – a more creative way of learning that feels more like play time. 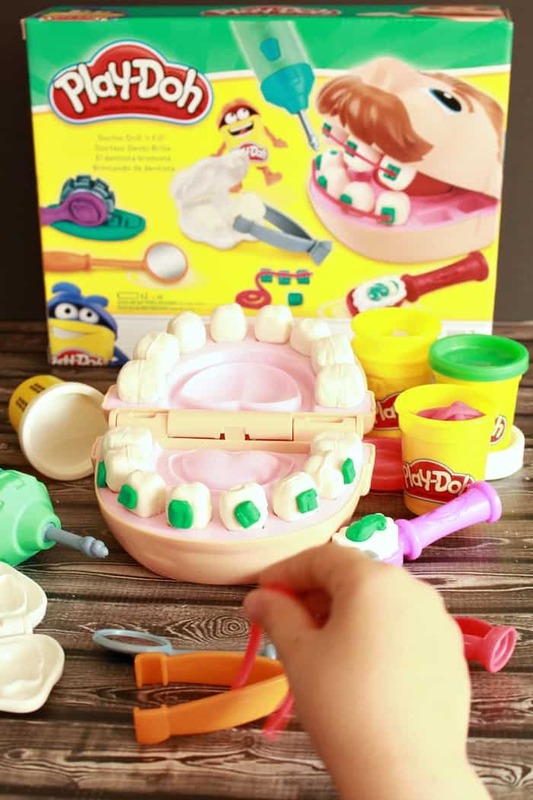 This is why I was so excited to see all the fun Play-Doh Modeling Compound learning activities! 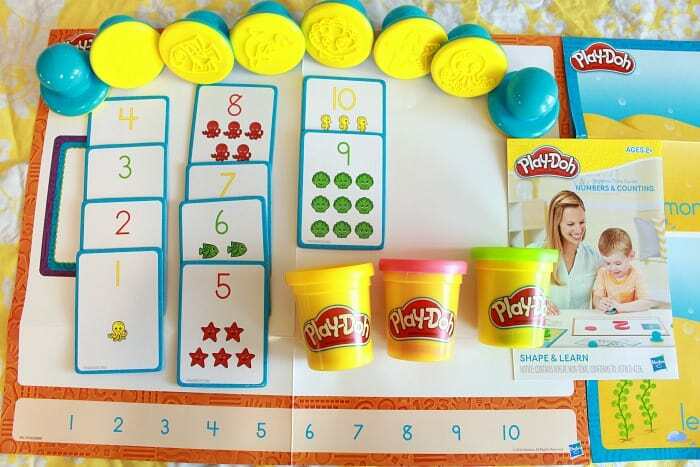 The Play-Doh Shape & Learn products are great for toddlers, preschoolers and kids in kindergarten to grade one. 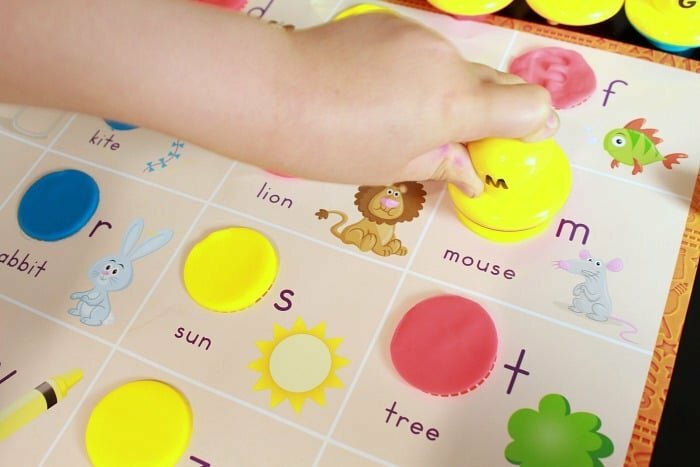 We tried the Colours & Shapes set, the Numbers & Counting set, and the Letters & Language set. 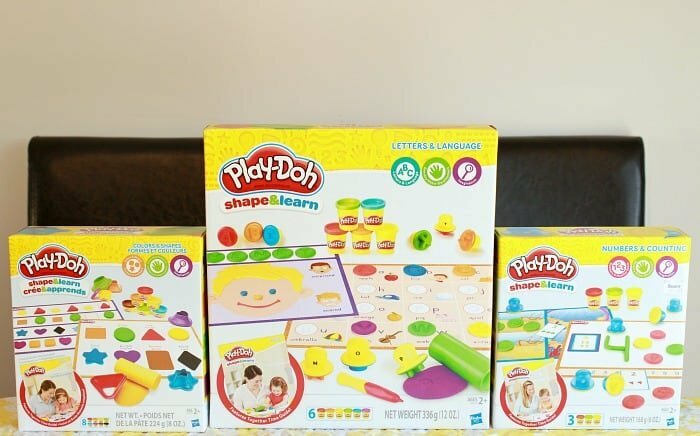 Each set comes with Play-Doh Compound, reusable worksheets, tools and a booklet for parents filled with fun & creative lesson ideas. 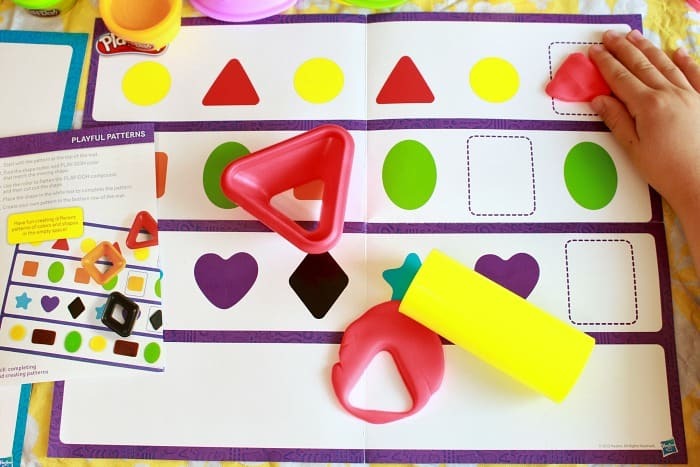 All of the Shape & Learn sets include activity ideas from basic to more complex making them suitable for kids from 2 years of age to about 6 years of age. 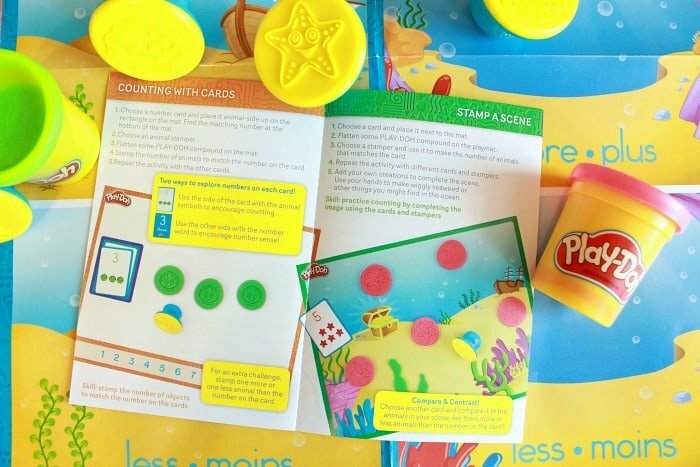 In the Numbers & Counting set, kids can practice counting with cards and stamps, use their creativity to stamp scenes, and further develop sensory motor skills – all while having fun! To add to the complexity here, we also used this set to practice math skills like addition and subtraction. 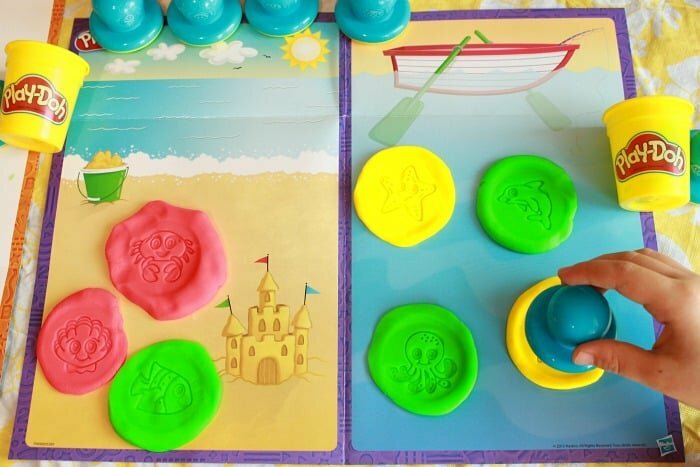 In the Play-Doh Colours and Shapes set, kids can practice learning their shapes, colours and matching patterns. 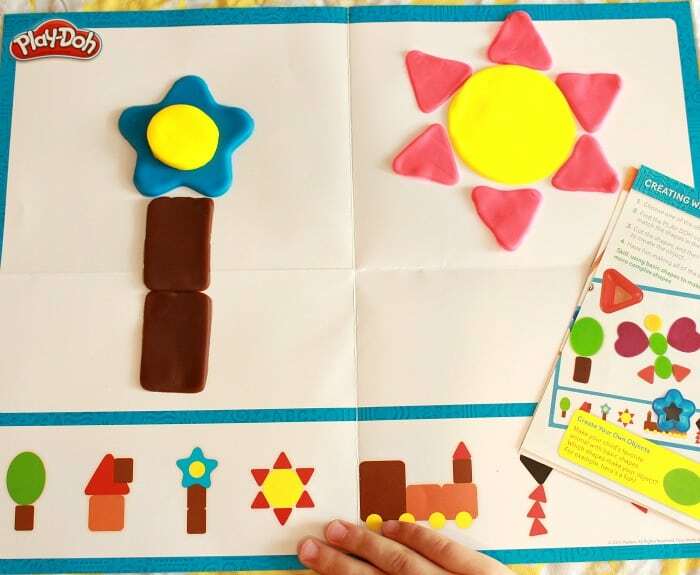 They can use their creativity to turn shapes into full pictures using the guide to make flowers, trains, kites and more. In kindergarten, my son did a lot of “matching the pattern” activities so this is one he took a lot of interest in. He also really enjoyed learning how to make different scenes using basic shape cutters. 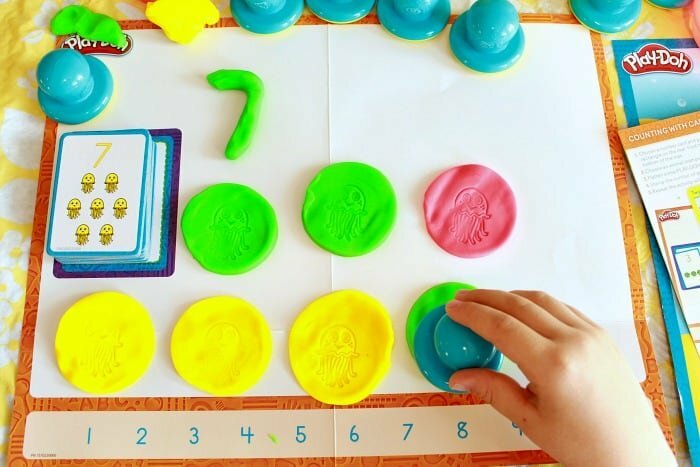 In the Play-Doh Letters & Language set, kids practice recognizing letters, matching uppercase letters to lowercase letters, letter sounds, printing and even spelling. Of all the Shape & Learn sets, my son (6 years old) was the most interested in this one. 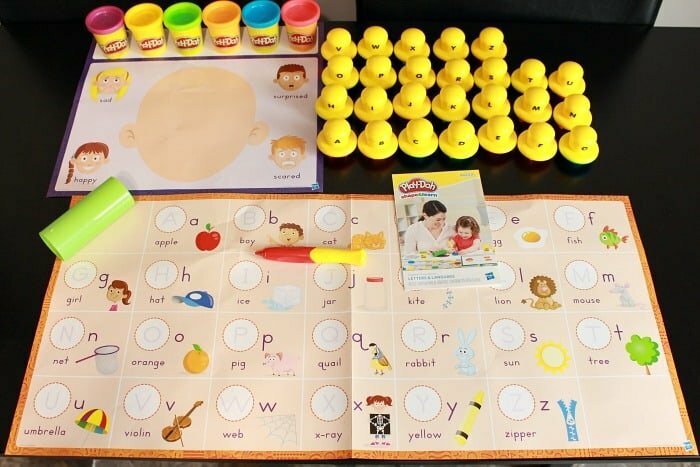 We did a lot of spelling & letter sound activities with this set that is going to help him with his reading skills that he’s just starting to develop. I love that we can spend this time together learning while having fun. Not only is it great for his development but also it really helps me to see just how much progress he made during his year in kindergarten. I’m so proud at how far he’s come! Let’s not forget about the importance of imaginary play! My son is an only child and I love hearing the conversations he has between his toys when he’s playing. He has quite the imagination! 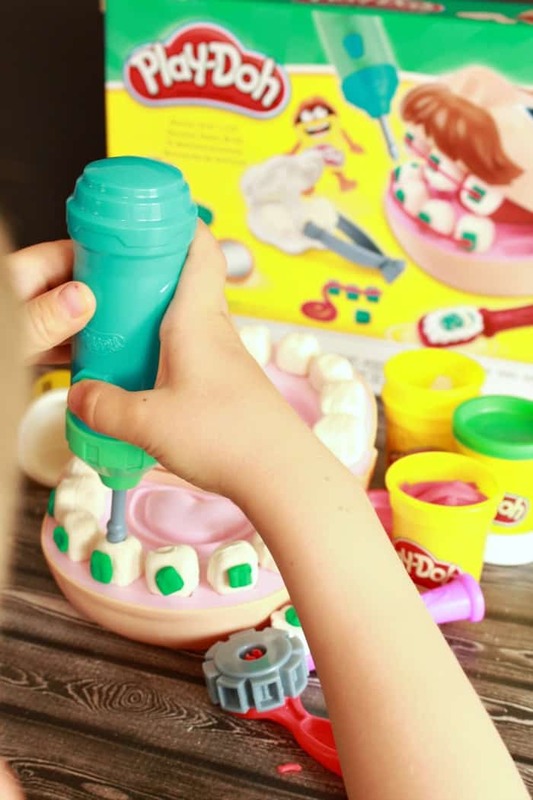 With the Play-Doh Doctor Drill ‘n Fill set, he got to play dentist by making teeth, making braces, even using the drill on teeth (yes, battery powered). 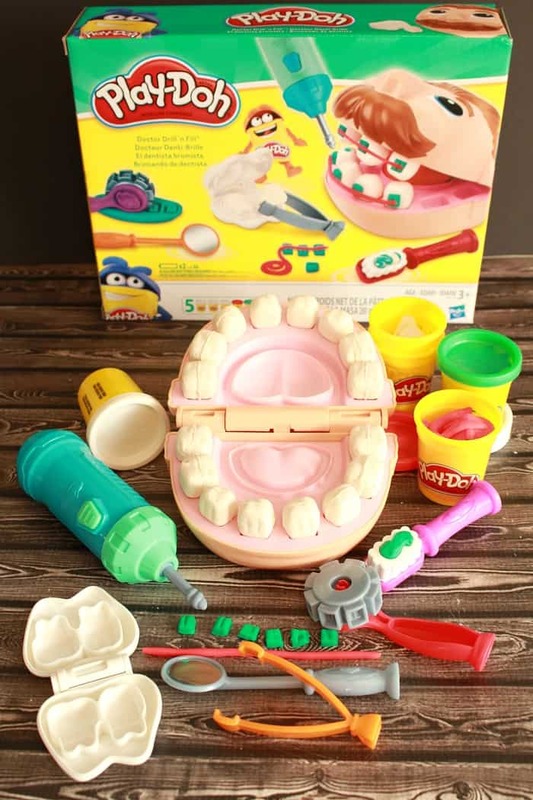 He learned all about “sugar bugs” in school and the importance of proper dental care so he loved playing dentist and educating his “patient” while performing dentist duties. 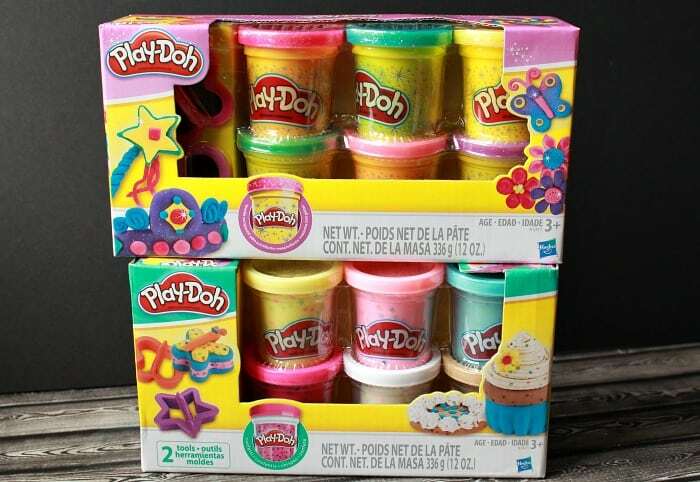 When making your back-to-school list this year, don’t forget about Play-Doh Compound products for learning at home. 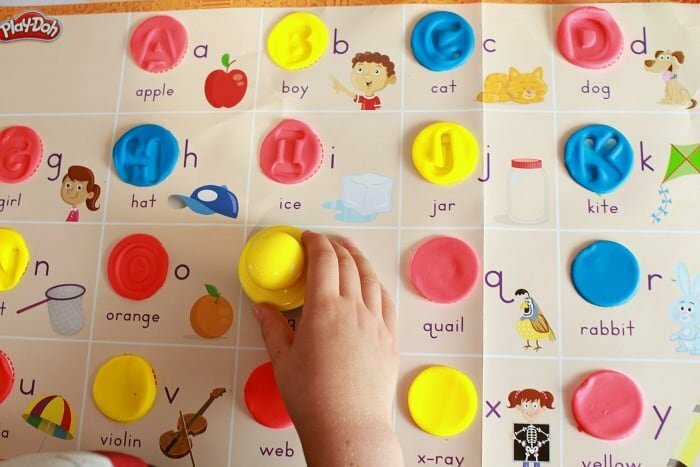 It’s a creative way for your child to further develop his or her skills while having fun. It’s an excellent activity for parents and children to enjoy together as well. 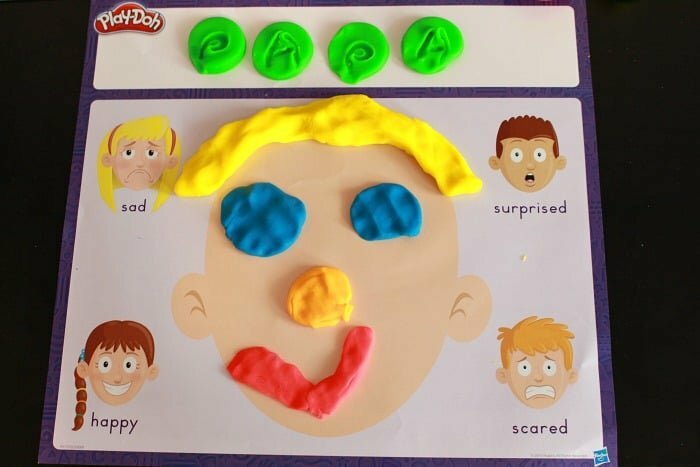 For Back to School Play-Doh ideas Click Here!